Our Brisket Rub recipes provide you the best and most popular options for having your favorite style of mouthwatering slow cooked Brisket. Jake's Famous brand Pure Santa Maria Rub and our Tri-Tip Steak and Rib Rub for sale are both superior blends of herbs and spices, black pepper and garlic that improve upon the old standard Santa Maria Style Brisket Rubs. Over the years Brisket has become a main line staple on the barbecue scene. True Brisket roasts require time and patience and most people buy them because they understand the time and energy it takes to produce and exceptional tasting meal. In case you needed a refresher on brisket we added in our brisket link. We season our Brisket with our Tri-Tip Steak and Rib Rub then we let the tri tip roasts marinate in the Tri-Tip rub seasoning for a minimum of an hour. The roasts after preparation are covered and placed in a fridge on a middle shelf during the marinating process. In the setup smoking process for brisket we like using wood fire (Red Oak) or Charcoal with smoking chips. If using smoking chips make sure you soak the chips in water for at least 2 hours. Then put a handful of chips on the coals or in a smoke box once you have reached the right temperature for smoking. I take BBQ Sauce or our special recipe Bourbon Glaze warm that and hold for serving with the Brisket. That warmed sauce becomes more of a condiment at this point and my guests are afforded the opportunity to lather on as much sauce as they prefer during their eating process. **When many people asked about what they would want more of in their lives. At a rate of 8 out of 10 answer, they wish they had more TIME. And while we can't give you more time, we can certainly reduce the amount of it you waste on non productive things. Yes, you could write down these recipes and gather the ingredients, blend them and walk through the marinating process. And yes, you could go through the motions of testing and marinating and testing and marinating to find out which one works best. But, why would you when you have access to the best Smoked and standard Brisket recipes right here on this website. That's right, we host 3 outstanding bbq rubs pre-measured, pre-blended and pre-ready for you to use. It might take you 3 days to collect the materials you need to get your Tri-Tip rub together from one of these recipes. But, if you act now you could have your favorite of our three brisket rubs in your hands tomorrow. That's right if your order any time between Monday and Thursday you could have the bbq rub of your dreams in your hands in handy right sized containers. A rich dry rub recipe with smoked hickory salt, brown sugar, granulated garlic, onions, coarse ground black pepper and the most perfect blend of herbs. How fantastic it is this straightforward, no frills, all action Santa Maria inspired dry rub. Combining rich hints of wholesome garlic, coarse ground black pepper, smoked kosher salt, the freshest parsley and hints of onion and mustard. The Santa Barbara Smoked BBQ Rub is a balanced blend of New Mexico Chili powder, cayenne, smoked hickory salt, brown sugar, granulated garlic, onion and more make this the quintessential dry rub. This rub delivers its best flavors for perfect brisket with increased flavor with the hints of smokiness. A natural dry rub in our stable of rubs. Get one or all of these dry rubs Today! Don't hesitate to get ahead of the pack by choosing the right rub for you. When it comes to making brisket for you and your friends, do you want to experiment or deliver proven results? Right, you want to deliver proven results. We've taken all the guesswork, efforts and time loss out of the equation. Just use our code: 1707200910 now to get an extra 10% OFF your next purchase at Checkout. Time is of the essence Order Today! Although these Rub Recipes are perfect for Brisket, they can all be used on select pieces of beef, chicken, pork ribs, beef ribs and fish. Select one, mix and sample on your favorite meat. 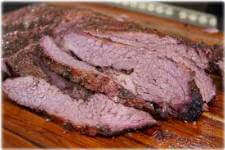 We've added an ebook eBook 12 Days Of Tri Tip Recipes. The eBook learning section puts together a group of recipes to ensure your best recipe results. This section covers Tri Tip recipes. Tri Tip Rub Recipes they can be adapted to support Brisket or Pulled Pork Shoulder. The eBook is a limited edition series and is available while supplies last. We'll start with how we make Brisket here at Jake's Famous Foods. We do a couple of things that maybe a lot of folks don't do but the results are always phenomenal. So, let's get started. 1. Once you've selected your Brisket from either the grocer or butcher you'll want to thoroughly clean the Brisket. Cleaning with just regular water is the preferred method that does not leave any residue on the meat. 2. You'll want to trim off any excessive fat. When we say excessive what we mean is that a good Brisket requires some fat on the meat. The fat breaks down in the cooking process and adds additional flavor to the meat. So leave enough fat cap on the meat so that it will add additional flavor. 3. Prepping the meat is fairly simple but it does take some time. After you've trimmed off the excessive fat and cleaned the meat a second time pat the meat dry with a paper towel. Once the meat is reasonably dry take some standard yellow mustard in a squirt bottle and squirt that all over the Brisket. Keep in mind the mustard can be just average style that you would find in a dollar store. Once the meat is squirted rub the yellow mustard all over the meat ensuring that all of it is covered. **A Note on the mustard process. We add mustard to the meat because it adds additional strength in breaking down the muscle fibers of the meat. The mustard will be absorbed into the meat and it will add a slight tartness to the meat which is highly desired when cooked. 4. Once the meat is covered with the mustard place in a container for resting. You'll want to rest the meat for a minimum of 1 hour and a maximum of 12 hours. Anything beyond 12 hours and basically the meat starts to turn to pulp. So, rest the meat a good two hours if you can spare it. 5. After resting you'll want to add either one of our Famous Tri Tip Steak and Rib Rub or the traditional Pure Santa Maria Dry Rub Just click on either term and you will be transported to their respective pages. Coat and rub the meat with either dry rub and be a little generous with the rub. This is a fairly dense meat and basically you'll just be delivering the rub into the first 1 inch layer of the meat. After the rub is applied allow the meat to rest again in a cool dry place preferably your refrigerator for at least 1 hour and 2 if you can do it. 6. Now your cooking time is going to take at least two hours or more so we want to make sure you get your grill ready. If using a charcoal grill you'll want to get the coals started in plenty of time ahead of the cooking. Here a good step after the meat has rested remove it from the refrigerator and place it in a sealed container on your counter. At the same time go out and start your charcoal grill. Note, you're grill will take anywhere from 15 to 30 minutes to reach a peak cooking temperature and during that time the meat will be resting getting ever closer to ambient room temperature. We do this so that the meat doesn't have to start on the grill flat cold which will take longer to cook and may actually deliver a poorer flavor to the meat. 7. Once the grill is ready add the soaked Red Oak Firewood onto the charcoals. The Red Oak will deliver a really nice flavor to the meat in addition to the dry rub. The fat cap should be on the upside of the meat. Turning the meat this way will allow a melting effect and will increase the flavor of the meat. 8. Place the lid on the grill and allow the meat to reach its smoking temperature. Remember brisket will take a fair amount of time to cook (approximately 6-8 hours) so plan ahead especially when smoking. After 30 minutes you'll want to check the temperature gauge to see if additional management is needed. If the temperature looks steady just leave the grill alone and monitor at least once an hour. If the temperature is too low or too high then adjust the vent down to reduce temperature and open it up more to add additional oxygen thereby increasing the temperature. 9. After about two hours you'll want to decide what you're final results will look like. Do you want the meat medium rare, or medium and if you have to medium well. I like medium so I tend to let the meat cook until it reaches about 200 degrees. Brisket grill temperature should average around 290 to 300 degrees. 10. Rest the meat for no less than 30 minutes. This will allow the juices to reabsorb in the meat making the Brisket even juicier. Following the resting period place the meat on the cutting board and with a sharp knife you'll want to slice off sections that are at least 1/4 inch wide. Another critical thing is direction for cutting the meat. You'll want to ensure that you cut perpendicular to the grain of the meat. The best way to describe it is if you stretch out your hand so that all your fingers are together then place your other hand on top so that your palm is facing you and it rests on all the knuckles. If this was a knife this would be considered perpendicular. The same applies to the meat because of where the meat originally comes from there is a degree of musculature that runs within the meat. Cutting in a perpendicular fashion opposite of the grain of the meat will allow the meat to chew to perfection. If you cut the meat with the grain where you'll be able to see lines formed in the meat the meat will be chewy so all that hard work will be for not. That's how we make Brisket using our Brisket Recipes and our Weber grill. If you're looking for Brisket Recipes like Tri Tip Dry Rub Brown Sugar recipe, Homemade Cajun Brisket Recipe, Santa Maria Brown Sugar Recipe, or more see all the recipes and ideas on our website: Jakes Famous Foods. Use Code 1707200910 with any item and receive a 10% discount.